It is July, 2011, and we have found time to revisit the beloved main site east of Churchill. 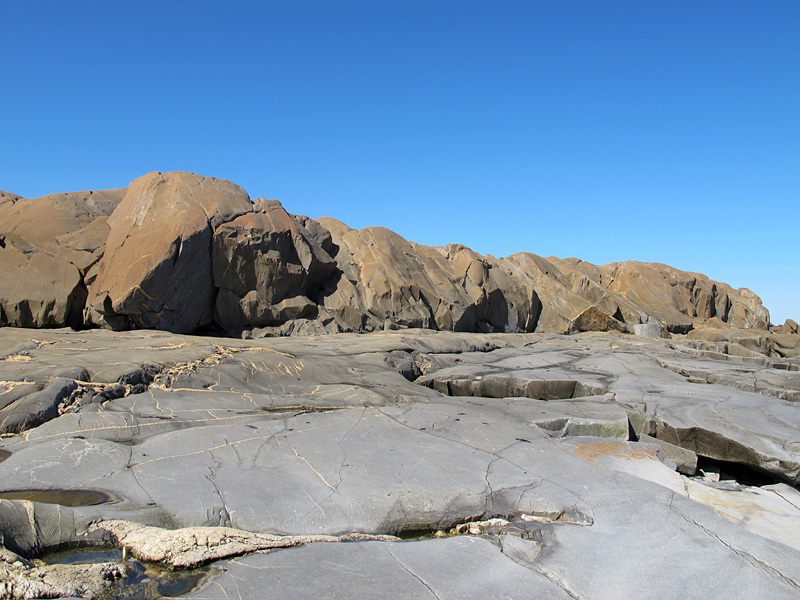 It is wonderful to again wander along that ancient boulder shoreline, examining the Ordovician corals that had been strewn there some 450 million years ago. 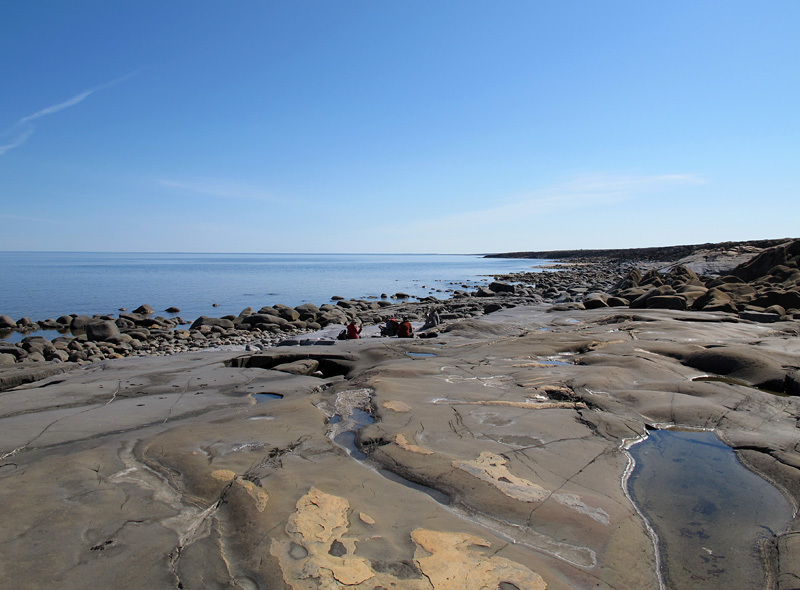 On the hottest day of our northern stay, the bright sun and low tide expose the site to maximum advantage. There is so much to see, and the morning feels very full as we explain this fabulous place to those who have never been here before. Later we walk westward heading for another favourite spot, a place we have always called “the platform.” There, we know that the smooth warm rock below a stark quartzite bluff will be perfect for a restful break. Taking a break on the platform toward midday: Debbie Thompson (foreground) and (L-R) Matt Demski, Sean Robson, and Dave Rudkin. 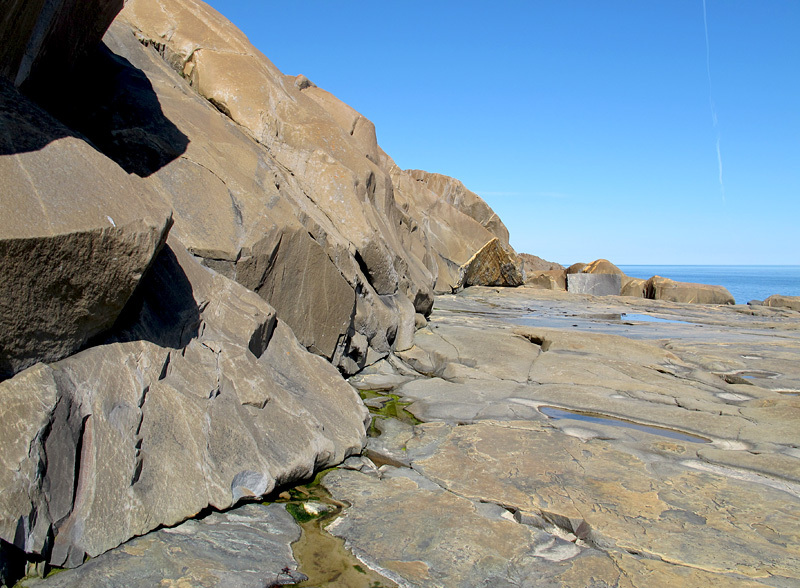 But how did this place come to be, where the quartzite has been smoothed so wonderfully by the action of waves and shore ice? 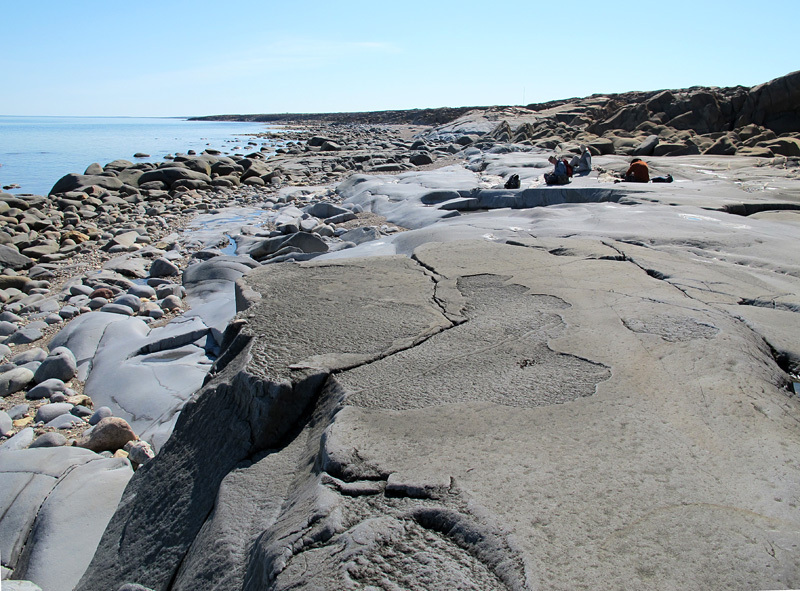 It is clearly a wave-cut platform in the modern world; the paleontologist also tends to wonder whether it took this shape back in the Ordovician Period, when this area formed a tropical marine shoreline. Just a short walk east, between here and the first of the boulder field sites, one can see places where the quartzite scarp is infilled with small patches of brown Ordovician carbonate, indicating that it was already exposed and deeply incised at that time. The scarp looms behind the platform like a small-scale Ayers Rock. The platform, however, yields no such clues. 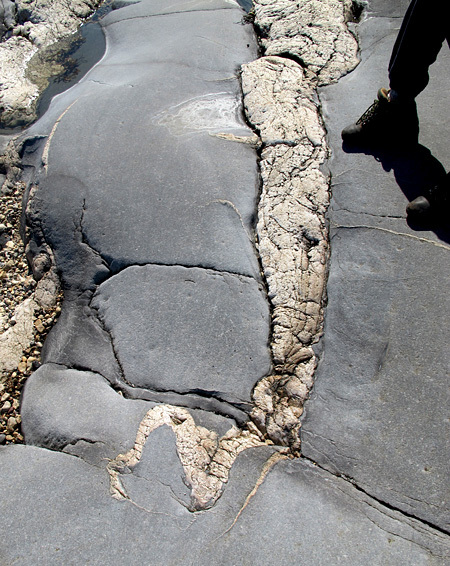 We have tramped across it and photographed every little indentation, but there is no Ordovician sediment to be seen. Just the enigmatic, staccato or sinuous quartz veins that transect so much of the Churchill quartzite. 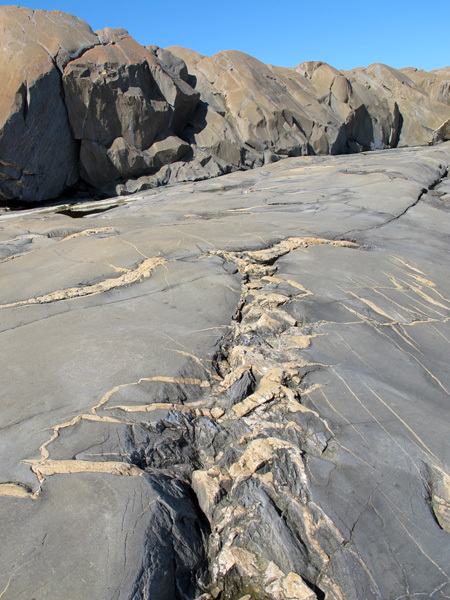 The platform was clearly formed along a straight joint, a plane of weakness along which the quartzite fractured cleanly. Quartz veins snake across the platform. But when did the fracturing occur? Was the platform much like this 450 million years ago, or is it a relatively fresh structure dating from the last few thousand years or so? Even if we sit here very quietly the rock will not tell us its secrets, over the shush of the waves and the plaintive calls of the gulls. I think we need to go back and check the platform at least one more time, Graham … on another warm, sunny, bear-free day. Thanks for sharing your experiences out in the field… there is a lot of exciting discoveries to be had…. 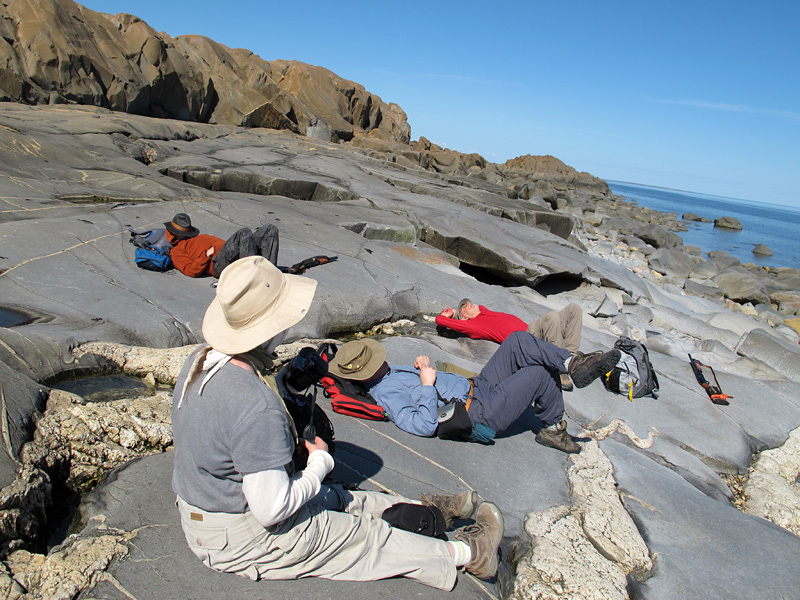 Great photography… a perfect sunny day to fossil hunt in the Ordovician! Thanks, Dave and Peter. Yes, the perfect day at the perfect place, and we do need to go back there some time. I really should post some field photos from those less than perfect days, but we take precious few photos when our hands are frozen! I share your delight in the scientific wonder of discovery (the fossils and their meaning), and the human sharing of like minded companions ‘on the rock pile’, with the tangential yet equally important pleasure of the scenery we must ‘endure’ for our science. And revealed so well by your sublime imagery. Sadly, I am a poor photographer. Thanks Dave. By the way, speaking of photography, how does your time look next month? I would love to make a day trip to Brandon to shoot some material through your wonderful scope, if I can book it for a full day! Well … busy teaching, but the ‘scopes will be available. OK, I will talk to you by e-mail!